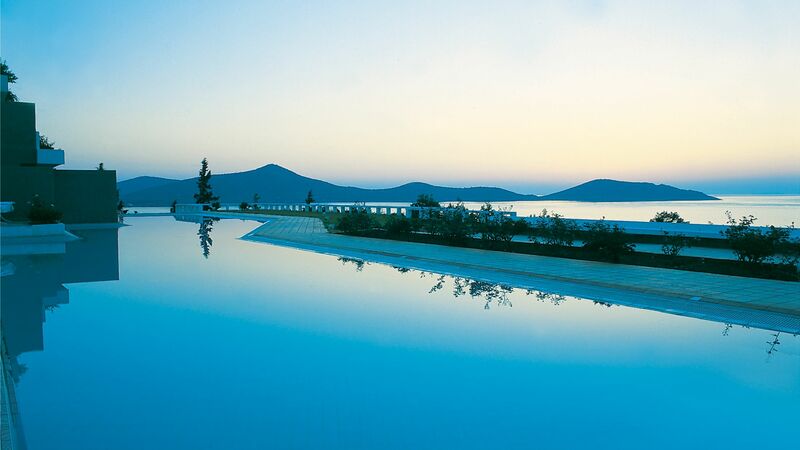 With views that’ll have you reaching for your camera again and again, it’d be easy to just lie back and drink in the scenery at the Porto Elounda Golf & Spa Resort but there’s plenty more to it than that. Whether you fancy a little activity on Crete’s only private golf course or putting in some dressing gown hours at the impressive spa there’s plenty to keep you busy. 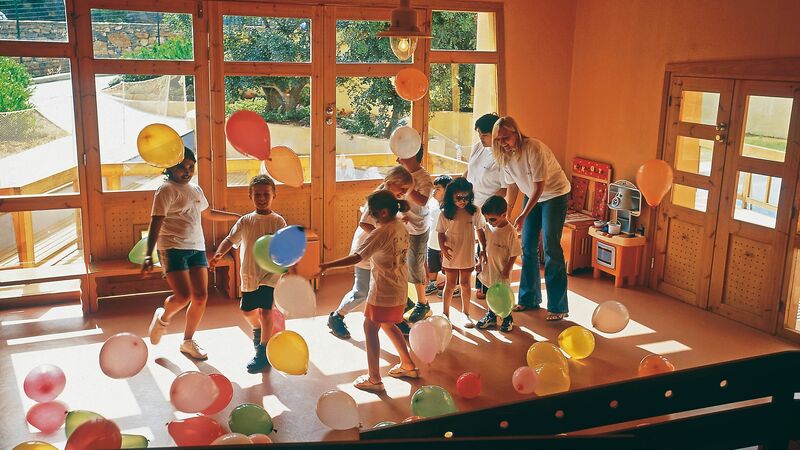 Ideal for families, the Porto Elounda Golf & Spa Resort offers a unique range of activities and clubs for children aged four months to 18 years meaning those travelling with older children can give them plenty of independence. There’s even a child-friendly spa treatment menu allowing guests age 5–12 to experience the world-class wellness facilities. Fancy exploring a little? 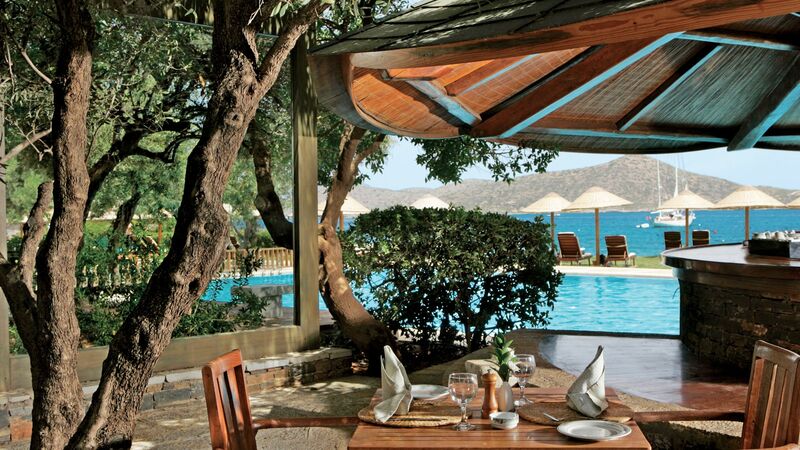 The pretty village of Elounda is just three kilometres away, head to the main square for authentic tavernas and a smattering of stylish bars or take a boat trip over to the famous island of Spinalong, a former leper colony, it’s the location for Victoria Hislop’s best-selling book The Island. Hotel child prices apply to ages 2–11 years. The hotel has 140 rooms, 6 floors, and 3 lifts. Guests can upgrade to the Dine Around option, which is available during high season (between 01 May - 30 September). 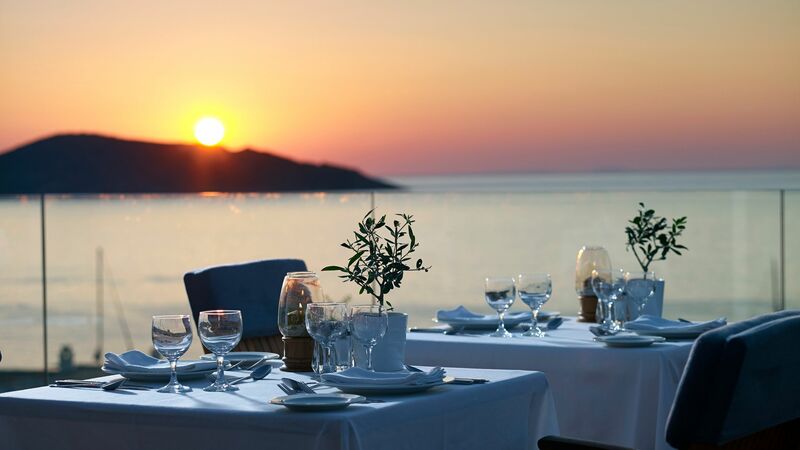 It includes meals at the à la carte restaurants in Porto Elounda Golf & Spa Resort, the Elounda Mare Hotel Relais & Chateaux and the Elounda Peninsula All Suite Hotel. Guests will be provided with vouchers for the relevant restaurants on arrival at the hotel. Drinks, certain dishes and fish night are excluded. Children who have been accommodated for free must also pay the supplement for the dine around option. This casual al fresco restaurant serves snacks and drinks during the day and delicious Italian cuisine by night. Perfectly located next to both the sandy beach and the pool, the Beach bar serves snacks and drinks, including cocktails, all day. Enjoy a pre or apres dinner drink on the beautiful terrace at the Kirki Bar; open until late it’s the perfect place to watch the sun set. Serving a buffet breakfast and dinner, Nafsika restaurant offers a generous selection which is sure to please everyone. Meals are included for half board guests. 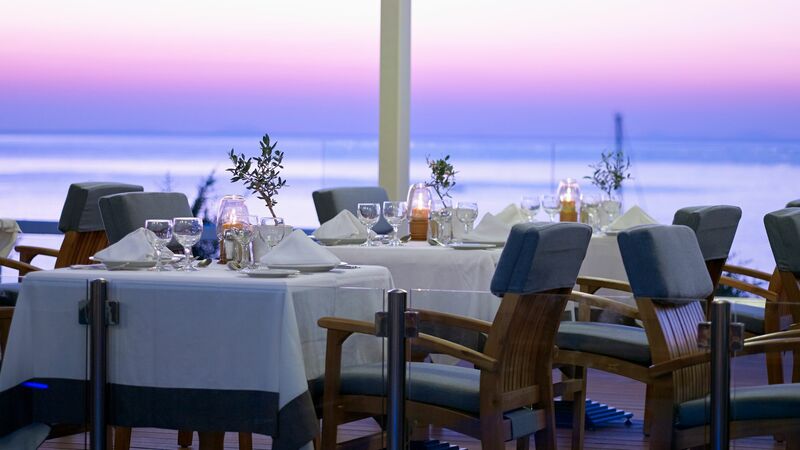 Make the most of the views at this waterfront restaurant serving fresh seafood and traditional Greek cuisine. The private Blue Flag awarded sandy beach is a peaceful and inviting place to while away the hours of sunshine. 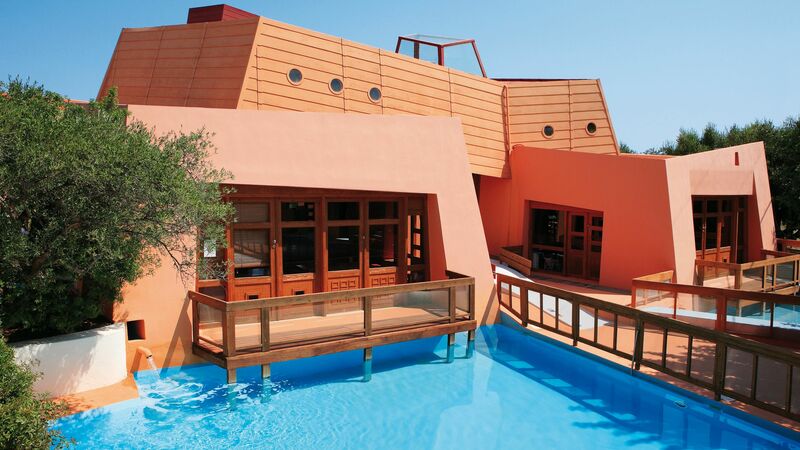 Choose from the main swimming pool, the family-friendly children’s pool or the indoor and outdoor pools at the Six Senses Spa. Families are well catered for, with a selection of services to delight children and parents alike. Services include a welcome gift bag, slippers and daily luxury toiletries in the room, a separate children's dining room which is open every evening from 6pm, children's menus and fresh baby food at the onsite restaurants, babysitting in the evening and a nanny service during the day. Guests can also rent items for in-room use, including: steriliser, bottle warmer, buggy, potty, step stool and baby bath. You may also ask for the room to be baby-proofed upon booking. This includes making plugs, corners and doors safe for little ones. 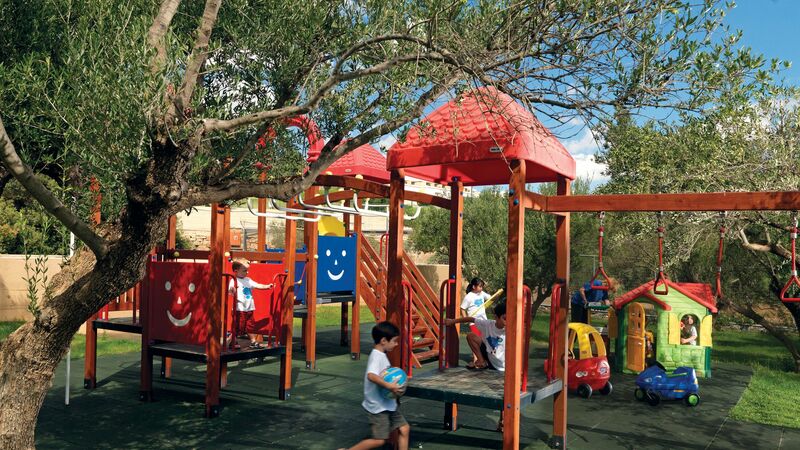 For younger children the crèche provides six day a week care with indoor and outdoor play areas and two shallow pools. From beach Olympics to treasure hunts, there are never two days the same at the Kid’s Ark Juniors Club. 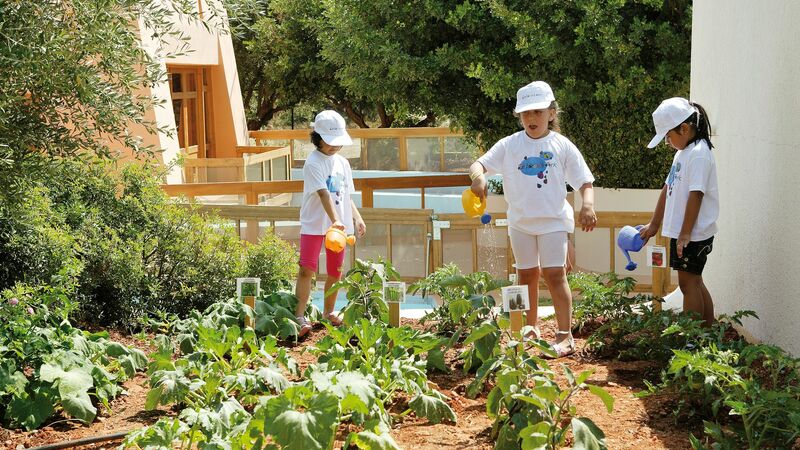 Introduce your children to the world of wellness with this exclusive day-long programme. Older children relax here and use the Wi-Fi, play computer games and take part in water sports activities or other sports. 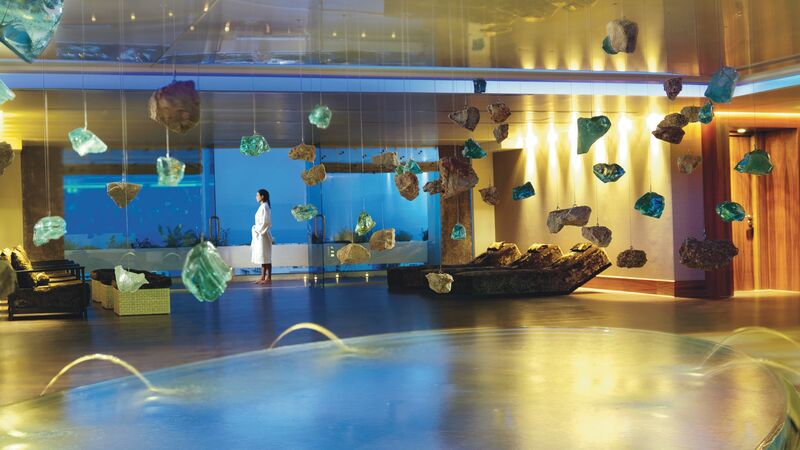 Spread over an incredible 2200sqm it’s easy to see why this impressive spa has been singled out as the ‘Best Spa in the World’. With a full menu of face and body treatments one visit probably won’t be enough. Children under the age of 11 are not permitted in the spa. Older children can enjoy treatments but must be accompanied by an adult. From a PADI certified dive centre to a private 9-hole golf course there’s a whole host of sporting activities to enjoy. Play a few sets on one of the three AstroTurf tennis courts, try your hand at wakeboarding or just play a few relaxed games of pool. Children aged 5-16 can brush up their football skills with this professional coaching programme. 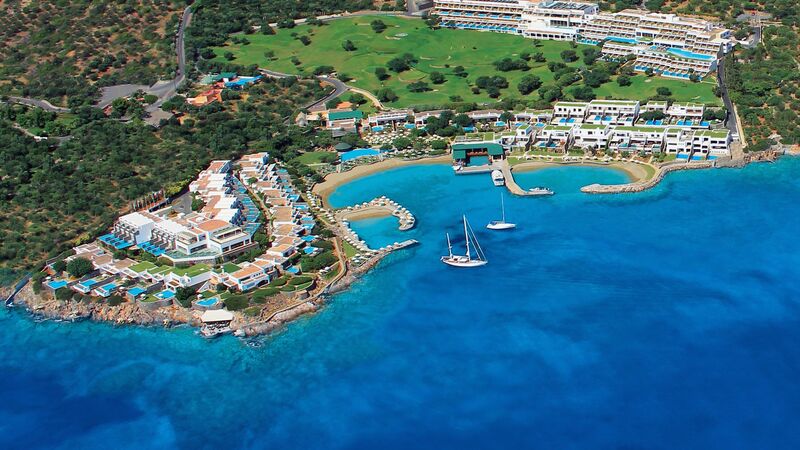 Porto Elounda Golf & Spa Resort can be found on the north east coast of the Greek island of Crete. 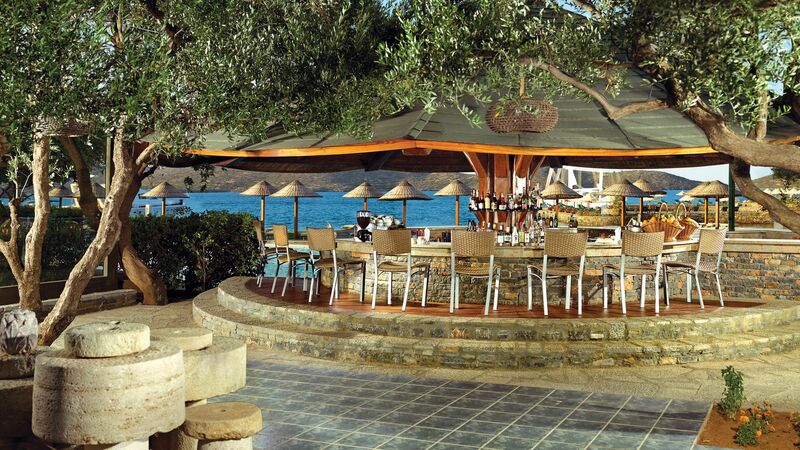 It’s in the pretty outskirts of Elounda, where you’ll find a selection of beaches, perfect for rest and relaxation. 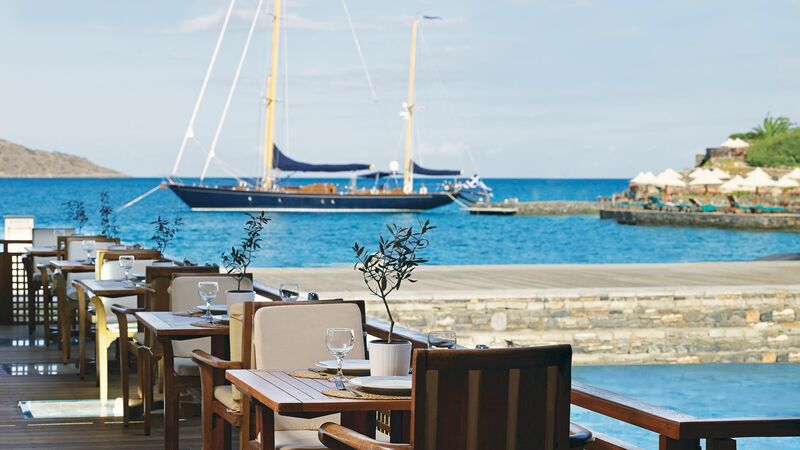 Head into the town for bars, restaurants, shops and a picturesque marina area full of luxury yachts and boats. When it comes to culture, take a boat trip across to Spinalonga Island, which is a former leper colony and home to an ancient fortress. The historic windmills along the bay provide a picturesque view, while Aghios Nikolaos is just a short drive away. Here you’ll find a sparkling lake, Venetian architecture and a further selection of shops, bars and restaurants. 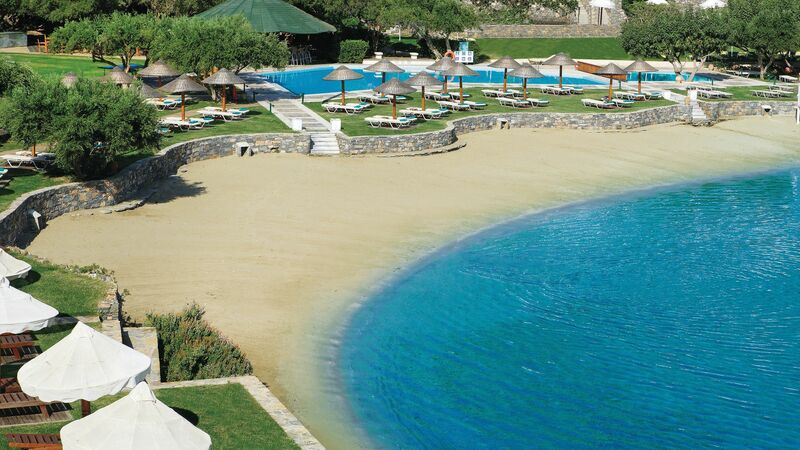 Porto Elounda Golf & Spa Resort is an hour’s drive from Crete Heraklion Airport. Porto Sea View Rooms have two beds plus a sofa bed, deluxe marble bathroom with bathtub and shower, and a balcony or terrace with sea views. Porto Sea View Interconnecting Rooms combine two of the popular Porto Sea View Rooms in order to offer a spacious accommodation option for larger groups and families. Porto Sea View Rooms with Shared Pool have a seating area, walk-in shower and a spacious terrace with direct access to a large seawater pool, which is shared between 6 to 8 rooms. 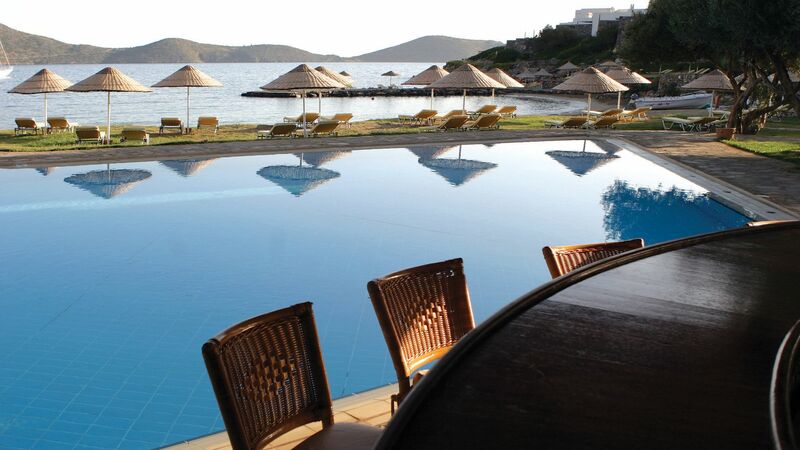 Porto Superior Rooms with Individual Pool have recently been renovated and feature spacious accommodation with a large balcony or terrace with fantastic views across the Aegean Sea and direct access to an individual pool. Porto Sea View Suites have a spacious bedroom and a separate living room as well as a private veranda with outdoor furniture. Porto Sea View Suites with Shared Pool have a spacious bedroom and a separate living room as well as a furnished terrace with direct access to a large seawater pool, which is shared between 6 to 8 rooms. Porto Sea View Suites have a spacious bedroom and a separate living room as well as a private veranda with outdoor furniture and an individual plunge pool. Porto Sea View Two Bedroom Suites have two bedrooms and two bathrooms and a separate living room, all with spacious furnished verandas. Porto Sea View Two Bedroom Suites have two bedrooms, two bathrooms and a separate living room as well as a spacious veranda with a direct access to a private seawater swimming pool. Guests receive one Thermal Suite session per adult per stay (free use of steam, sauna, thalassotherapy pool) for holidays between 04 May - 28 October 2019 (minimum stay of 3 nights required). Free access to Kid's Ark with supervised activities valid for children between 5 - 12 years, Monday to Saturday between 10:00-18:00 for holidays between 04 May - 20 October 2019. Family offers available - please call for details. The view from the hotel at the gulf of Mirabello is stunning !!! The rooms are spacious and nicely decorated !!! Exquisite golf amenities. But the most important part is the service. The staff is always helpful, smiling and ready to serve you and to reply to all your questions. A big BRAVO. Returned here in October just over a year after having our honeymoon here. The service and facilities were fantastic again. Staff are so friendly and helpful. The food is fantastic. Huge choice for breakfast and varied evening meals. Private beach was spotless and not too busy. Large balcony and spacious room.